I wanted to write something profound and inspiring for my inaugural blog post. Something big and meaningful involving the mysteries of the universe, a photographer's interpretation of the meaning of life, a post that would make the heart soar and bring a tear to the eye. Instead I am writing about jackal spit. I had been working hard for the first part of the year on a work project that would take me to Namibia. 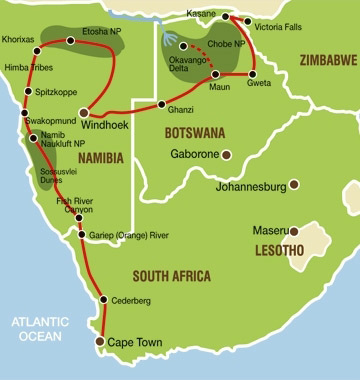 Following that trip I planned an overland safari that would take me from Cape Town, South Africa to Victoria Falls, Zimbabwe over the course of 3 weeks. "Elizabeth! The jackals stole your shoes! Come quick!" Really? I was already hot and cross and tired and stinky and wanted nothing more than a cold gin and tonic and a hot shower. I saw in the waning evening light 2 pairs of eyes glinting in the twilight, and even worse, my shoes hanging out of their mouths. To add insult to injury they had also stolen all my Cadbury Milk Chocolate bars and they had chocolate drool oozing from their snouts. With a crazed howl, I took off after them into the bush, much to the consternation of Shadwell our guide. Shadwell was not happy to see his friend and client disappearing from view into the wilds. The jackals, startled by this howling apparition coming after them, dropped my shoes and vanished. Thanking my physician for insisting on rabies shots I picked up my saliva encrusted shoes and took them into the shower with me for a serious germ take down session.